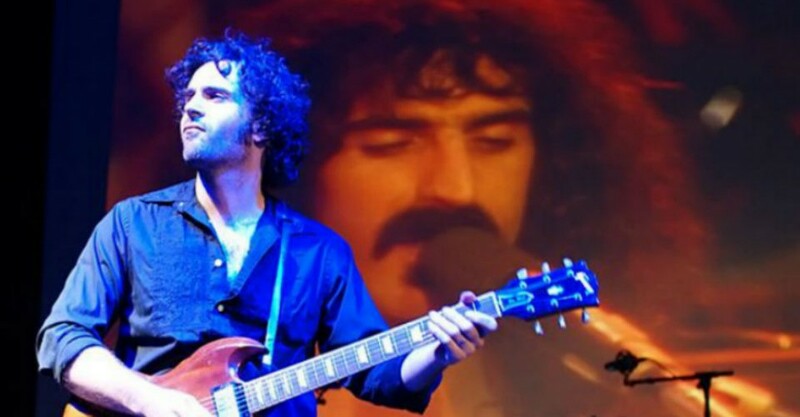 Governor Hindmarsh Hotel, Sun 25 Feb.
As part of the 50th anniversary celebration of the music of Frank Zappa, the prodigal son Dweezil returns to Adelaide to play some of his personal favourites of his father’s work with his band, convivially titled, The Others Of Intention. In this incarnation of the group Dweezil leads a band of mighty performers: Scheila Gonzalez on saxophone, flute, keyboards, harmonica and vocals, Ryan Brown on drums, percussion and vocals, Chris Norton on keyboards, violin and vocals, Kurt Morgan on bass and vocals and Cian Coey on vocals. The set was a mixture of songs and medleys from such albums Freak Out!, Absolutely Free, Hot Rats, Weasels Ripped My Flesh, Over-nite Sensation, One Size Fits All, Sheik Yerbouti and more. In true Zappa fashion, not every song was played the way they appear on the albums. Opening with a masterfully performed version of Zombie Woof which seemed largely untouched in arrangement (I mean, how could you? ), Suzy Creamcheese and Call Any Vegetable, which seemed reminiscent of 1971’s Live At Pauley Pavilion LA version as opposed to the original. 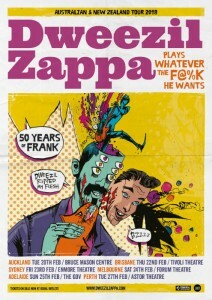 Other parts of the concert paid tribute to certain albums such as the wildly rearranged medley of Oh No and The Orange County Lumber Truck from Weasels, while others took an air of light persiflage by implicating a line from The Bee Gees’ Stayin’ Alive within Zappa’s Trouble Every Day. Much to the delight of some musician-folk or avid Frank Zappa fans this tour featured a performance of The Black Page (jovially poking fun at a piece of music with too many notes). Originally written for the drums, it is known for being extremely difficult to play and features a drum solo in the beginning valiantly performed by Brown. The crowd roared unremittingly as their set ended; an obvious cry for an encore was made and The Gov was hit with Sofa #1, Po-Jama People and an energetic version of Florentine Pogen all from the One Size Fits All album. No pyrotechnics, bells or whistles were needed to make this show entertaining as it was all captured in the energy of the performance and the music itself. Frank is known by some of the best in the world for setting the bar, and tonight, Dweezil and his crew jumped over it.